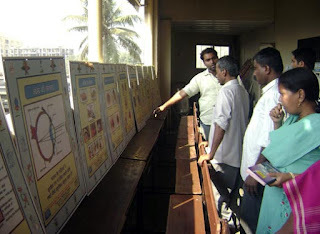 Andhra Karnataka Sangh, Bharatratna Dr. Baba Saheb Ambedkar Vidyalaya and Jr. College, 301 (p), Sant Kakkaya Marg, Dharavi, Mumbai – 40001, approach pragatee foundation to conduct Eye Check-up camp on 3rd Jan 2009 between morning 10am to afternoon 2:00 pm. 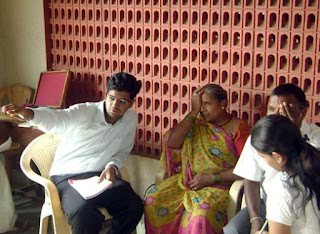 Pragatee foundation is always ready to conduct such social activities. We have contacted to our regular doctors and K.B. HAJI BACHOOALI HOSPITAL, Mumbai to send their team to conduct Diagnostic eye camp. All patients registered in the camp for cataract surgery will be brought in our bus and operated FREE OF COST at K. B. HAJI BACHOOALI HOSPITAL and dropped them back at the campsite. Prominent publicity should be given to this fact. Camp was organized by Pragatee foundation with help of local corporator and chairman of Andhra Karnataka Sangh Mr. Shankar Santi. Hon. MP Mr. Eknathji Gaikawad and Hon. MLA Mrs. Varshatai were present to inspect the camp. Camp was successfully organized and approximately 300-400 people were check-up their eyes. 10 cases were detected for cataract operation and were operated absolutely free of cost at K. B. HAJI BACHOOALI HOSPITAL. All Expenses was bare by pragatee foundation. President Mr. Kiran S. Rane, Seretary Mr. Haresh Pagare, Trustees Mr. Krishna bokka and Dr. Baba L Meshram were present during entire camp time. Exhibition about Eye and Care was also organized during this camp.